Provide comfort for the family of Jacquellyn M. Pace Belgau with a meaningful gesture of sympathy. Jacquellyn Mae McKoy Pace Belgau was born July 29, 1929 to Thomas and Ruth McKoy in Toledo, OH. She was raised along with her younger sister, Jeanette, in Sarasota, FL, where she graduated from Sarasota High School. She then attended Florida State University, the first year it became a co-ed college. It was there that she met James “Jim” T. Pace and fell in love. So, she traded in the BA for an MRS. and the couple was married on April 17, 1949. Jim and Jackie moved to Chicago, IL for Jim to attend trade school and they soon welcomed a tiny surprise addition to their little family, James Thaddeous “Thad” Pace, Jr. With a new baby in tow, the Paces moved back to Sarasota to find work, but eventually landed in the Panhandle, where Jim was from. Jim began a career with Chemstrand/Monsanto, where he worked until retirement. In 1954, while living in Pensacola, another baby boy came along, named Donald “Don” Gregory. During these years, Jackie came to know the Lord as her personal savior and was baptized into new life. In 1958, the Pace family moved to Santa Rosa County and joined First Baptist Church of Milton, where they planted roots and were active, life-long members. 1960 brought Jim and Jackie their baby girl, Connie Michelle, to complete their family. 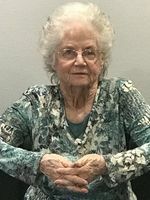 Jackie was a stay-at-home mom until the late 1960s, when she became a teacher’s aide at Berryhill Elementary, developed lifetime friendships with co-workers and worked there until retirement. In later years, the couple enjoyed fishing, camping, visiting Flea Markets, having daily coffee with friends and family, and vacationing at their Franklin, NC cabin. Jim and Jackie shared 55 years together and were blessed with 6 grandchildren and 13 great-grands. Jim passed away in 2004. In 2006, Jackie married the late Steven A. Belgau, her high school sweetheart, after becoming reacquainted at Jackie’s 60th high school reunion. Due to health issues, Steve and Jackie shared only 11 years together but they were years filled with great love and happiness. Steve and Jackie brought light and life to one another and to the family. Jackie was fortunate to share in a special kind of “sisterhood” with Carolyn LeGro, Geneva Strickland, Marietta Smith, Millie Jo Hudson, and Doris Kingry. She treasured these friendships as well as the close relationships formed with longtime neighbors. Jackie was a member of the Martha Sunday School class of First Baptist, a class full of those who were faithful to reach out, encourage and bless her for many years. Jackie is survived by her children: Thad (Debbie) Pace, Don (Shannon) Pace, Connie (Cameron) Smith; grandchildren: Cheree (Brad Calhoun) Moore, April (Cody) Busby, Brigette (Brian) Oden, Donnie (Debbie) Pace, Jameson (Tracy) McKerlie, Maria Arceo; 13 great grandchildren and numerous nieces and nephews. 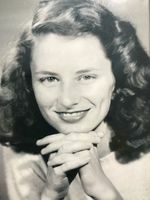 Visitation will be held at 10:00 A.M. on Monday, April 15, 2019 at the Betty Bamburg Chapel of First Baptist Church, Milton, FL. A Celebration of Life will follow at 11:00 A.M., with Dr. David Spencer officiating. Internment will follow services in Serenity Gardens Cemetery, with Trahan Family Funeral Home, directing. In lieu of flowers, donations may be made in memory of Jackie Pace to St. Jude’s Children’s Hospital or Catholic Charities Adoption Services (CCNWFL.org). To send flowers in memory of Jacquellyn M. Pace Belgau, please visit our Heartfelt Sympathies Store. We encourage you to share your most beloved memories of Jacquellyn M. Pace here, so that the family and other loved ones can always see it. You can upload cherished photographs, or share your favorite stories, and can even comment on those shared by others. Provide comfort for the family of Jacquellyn M. Pace Belgau by sending flowers. 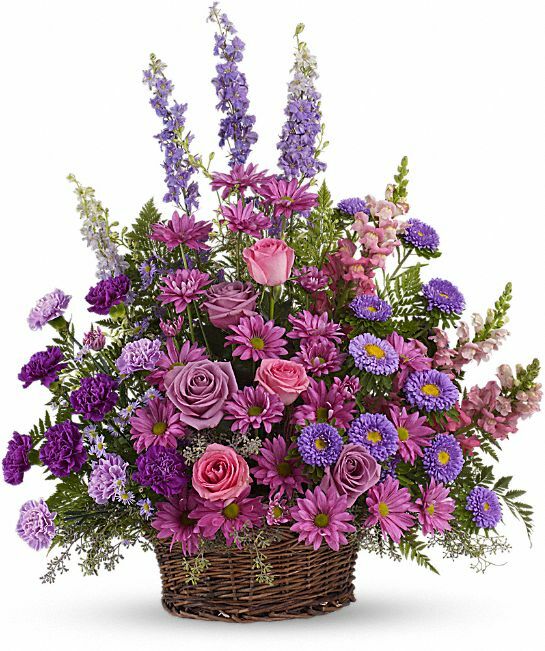 Heartfelt Sympathies Store purchased the Gracious Lavender Basket for the family of Jacquellyn M. Pace Belgau.